Nestled at the foot of America's Mountain, the historic Cliff House at Pikes Peak evokes an atmosphere of Victorian romance and opulence dating back nearly 150 years. 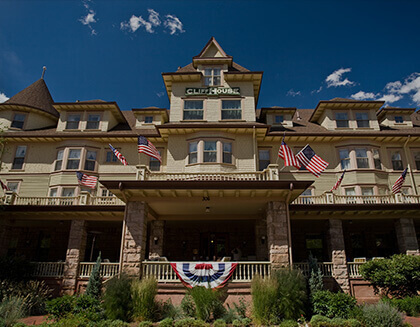 From its storied start as a stagecoach stop to its turn-of-the-century prominence as the area's premier mineral resort, it remains the crown jewel of Manitou Springs. 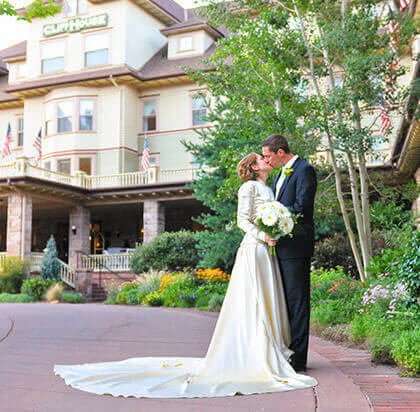 Stately and spellbinding, The Cliff House at Pikes Peak pairs the glamour of a bygone era with the modern-day style, sophistication and services worthy of its AAA Four Diamond status. 01 You’ve Never Slept In A Teepee - Check into our one-of-a-kind Buffalo Bill Suite, which resembles the inside of a teepee on the High Plains. Other touches that pay homage to the showman and folk hero include a lasso and vintage marquee posters. 02 Wine Is Your Passion - Our 800-bottle cellar is an award-winner, lovely overseen by a staff of sommeliers, including two who are certified by the Court of Master Sommeliers. What pairs best with our Buffalo Short Ribs and Rocky Mountain Trout? Just ask! 03 You Believe Nothing Beats Mountain Air - Stake your claim to a spot on the Veranda and breathe in the fresh Rocky Mountain air while you savor the best show in town: a spectacular sunset over Pikes Peak. 04 Adventure Is Your Middle Name - From rock climbing and rafting to mountain biking and hot air ballooning, our concierge can arrange a thrilling day of adventure in the shadow of Pikes Peak. 05 You’d Like To "Take The Cure" - Sample the mineral springs that gave Manitou Springs its name on free, guided tours of the town’s eight springs on Saturday mornings from Memorial Day to Labor Day. The Cliff House at Pikes Peak has 54 beautifully appointed hotel guest rooms and luxury suites, each uniquely decorated in the style of the late 1800s, complimented by modern services and amenities. 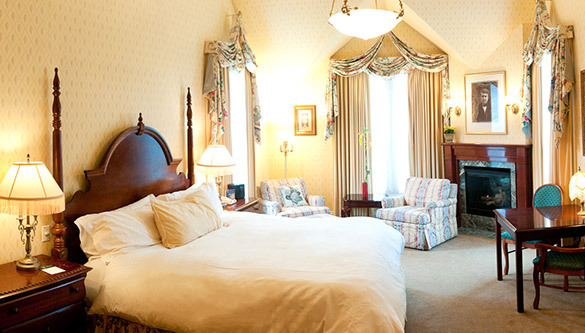 Each room is individual in character and may include special features such as gas fireplaces, two person spa tubs, steam showers and towel warmers. Stories are what inspire us. The stories that are started here, by brides and grooms celebrating their weddings. The stories that are commemorated here, when couples choose us for their anniversaries. And the stories that are shared here, when family vacations become unforgettable memories. These stories are woven into the fabric of The Cliff House at Pikes Peak. Very nice room, with a fireplace, steam shower, pillow options, turn back service and many other amenities beyond what we expected. The breakfast buffet included hot and cold choices in a splendid dining room. Dinner in the dining room was pricey, but 5 star cuisine. 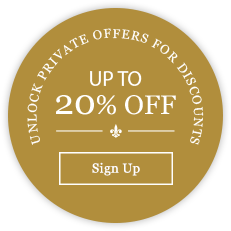 Great location, excellent service and beautifully done historic decor all made for a luxury experience. Pikes Peak: America's Mountain - This 14,115 ft. mountain provides stunning views for up to 80 miles. Weather permitting, Pikes Peak is accessible year-round via the Pikes Peak Highway. The Manitou Incline - If you are looking for an intense hike, this is it. This intense trail hike has finally been opened to the public. Pikes Peak Cog Railway - This amazing train climbs up exhilarating grades and curves. Riding the Cog Railway reveals stunning hidden vistas that are only visible from the train route. The Cave of the Winds - The Cave of the Winds offers two types of cave tours: the tamer Discovery Tour, and the pulse-pounding Lantern Tour (not for the faint of heart!). The United States Air Force Academy - This legendary school/air base is home to one of the nations top universities. Take a tour of the beautifully designed Cadet Chapel or take in a game. Manitou Cliff Dwellings - Step back in time as you explore the history and heritage of Native America culture. The Garden of the Gods - Awe-inspiring rock monoliths cut through the majestic Colorado landscape just minutes from The Cliff House. Cheyenne Mountain Zoo - Named one of the Top 10 Zoos in the U.S. by TravelAdvisor.com, the Cheyenne Mountain Zoo is a unique mountain zoo experience. Seven Falls - Drink in the cascading grandeur of this legendary 181ft. series of falls. North Cheyenne Canon Park - This picturesque 1,600 acre pack is one of the best hidden gems of the Pikes Peak area.